I have been honored to be a part of previewing Crystal Paine’s new book. I am by-in-large a very organized, focused person. I keep a well maintained house, can usually find what I need, save money using coupons, etc… So, I began reading, thinking I might pick up a tip or two. However, God had other plans. As He so often does, He used the book as one more avenue for getting a message across to me. A message about goals. It’s amazing that as a Second Season Mom I have never really set goals. I typically have an idea of what I want, and I have been fortunate to arrive at the end result most of the time. However, lately that hasn’t been enough. More than ever I want to live effectively by living with efficiency. I don’t want to send my girls off to college worried about finances. I don’t want to send my girls off to college feeling I missed the boat, that I didn’t impart all I had wanted to impart. I don’t want to just have friendships. I want lasting relationships with people who impact me, people who are making a difference in the lives of those around them. I want to be healthier, be strong and vibrant ready for all the seasons of life to come. A year ago I took the real estate exam so I could help sell some investment properties we had been holding. I made a good decision joining Keller Williams Realty. I am still not certain what role real estate will play in my life over the course of the next year, but, I know Keller Williams Realty was meant to play a role in my life. Never have I received so much training on goal setting, attacking the day with a plan and a purpose. Never have I been encouraged to think about my Big Why. As much as I have soaked up, I have still resisted. I think in part because I still don’t feel like I have landed professionally right where I am supposed to be. While doing real estate, I have also ventured out with a friend to open a professional organizing business. I am also active in voluntarily helping to restructure and assist with a second “re-opening” of Christian Women’s Job Corps. I am also now home schooling a high school student! Life is full. Life is probably too full. Nothing though will come of any of this without some goals. I don’t think I’ll even know for sure whether or not I’m doing the “best things” until I set some goals, assign some specific actions and re-evaluate weekly. I know and yet I still resist. Crystal’s personal story has compelled me to lay aside my fears-to quit resisting. As Crystal says, “People fail because they don’t stick with something long enough.” I can see that without setting some goals and getting deliberate about daily doing one thing to bring me closer to the goals, I will give up. I have let fear of failure keep me from setting goals. In reality though, not having goals hasn’t shielded me from failure. Nor is failure a bad thing. Just as Crystal’s personal life experience proves, success only comes with perseverance and a dose of failure or two. I don’t want to jump from thing to thing. I don’t want to wonder if I have failed or succeeded. I am going to have to set goals. I may miss the mark. I may not meet every goal. Some might call that failure, but I am going to see it as learning, growing. I am refusing to have any New Year’s Resolutions. What are those any way? We all set them, or at least think them. At the same time, we plunge ahead assuming or planning to give them up within a matter of weeks. So, no more resolutions. This year I will set goals. I will know exactly how much weight I want to lose. I will break it down into a weekly goal and then determine one thing to do each day to hit the weekly mark. I will know exactly how many homes I want to sell, how many organizing clients I want to have… You get the picture. And from my efforts I know I will find myself closer to being who I want to be, doing exactly what God has ordained for me to do. I am going to expect some bumps along the way, but I’m going to keep moving. If you need a little boost. If you, like me, have avoided goal setting, I encourage you to read Crystal’s book. 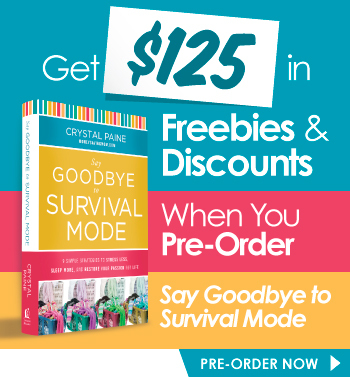 http://moneysavingmom.com/2013/12/get-125-freebies-discounts-pre-order-book.html. None of us need feel we must conquer the world. We do need a plan though. We need to know that each day is not wasted, not thrown to the wind. We need to know we are being effective, we are finding our way to that full life.